Lucas St. Clair talks about a Mt. 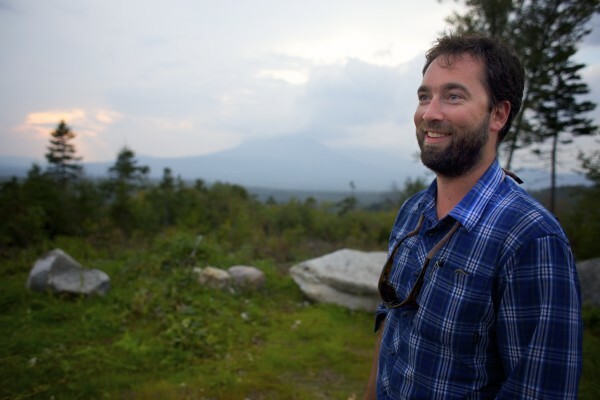 Katahdin at a lookout where Elliotsville Plantation Inc. has opened 40,000 acres to hunting and other recreational use in September 2013. Efforts to form a national park in Maine’s Katahdin region continue and include a formal lobbying effort in Washington, D.C., according to the park’s leading proponent, who says he has discussed but is not pursuing an interim “national monument” designation on land adjacent to Baxter State Park. Lucas St. Clair, whose family owns the property eyed for the park, said the national monument tag would be sought only as a temporary step toward securing the national park designation. President Barack Obama has used his authority under the Antiquities Act of 1906 to designate 19 national monuments, breaking the record of 18 held by President Theodore Roosevelt. The most recent was designated on July 10 in Waco, Texas. The 100th anniversary of the National Park Service in 2016 is expected to spark more designations during Obama’s final year in office, including one for the approximately 87,500-acre parcel owned by Elliotsville Plantation Inc., the nonprofit foundation managing lands purchased by St. Clair’s mother, entrepreneur Roxanne Quimby. Quimby and St. Clair have said the park service’s birthday would facilitate the passage of a federal bill for a park, which congressional officials said would typically take three to nine years, barring any significant federal resistance. Sixty-three pages of documents released by the U.S. Department of the Interior in response to a Freedom of Information Act request filed by the Bangor Daily News show that George Cooper, a lobbyist from Forbes-Tate, a public policy consulting firm in Washington, D.C., has held phone conferences, met or corresponded with Interior Department officials about a half-dozen times on behalf of the park effort since April 13. The majority of the documents appear to show the scheduling of meetings or conference calls with federal officials for St. Clair or Cooper. No significant details of what transpired in the discussions are apparent, but St. Clair confirmed Cooper’s employment and said the requirements of a national park were the primary discussion points. In his talks with federal officials, a national monument designation was discussed as one of the routes a park effort might take, said St. Clair, who indicated that a park effort would likely continue beyond 2016. About 105 of the 409 national park units managed by the National Park Service under federal law or created by executive order began as federal monuments, said Kristen Brengel, the National Park Conservation Association’s senior director of legislation and policy. The park service lists 138 national monuments at NPS.gov. In Maine, there has been resistance to a national monument designation since votes in East Millinocket and Medway earlier this year rejected the park proposal. In an Aug. 28 letter to Obama and Maine’s congressional delegation, Gov. Paul LePage said a national monument designation would harm Maine’s economy and forest products industry stalwarts. “A national monument designation makes Maine timber off limits to the forest products industry,” LePage wrote in his letter to Sens. Susan Collins and Angus King, and Reps. Bruce Poliquin and Chellie Pingree. Park opponents Jim Robbins and Bob Meyers said Friday that they hope a monument designation is not placed on the Quimby family’s land. Meyers, executive director of the Maine Snowmobile Association, said any pursuit of a monument designation by St. Clair and his organization “demonstrates their total lack of regard for the local people” around the Katahdin region. “I am not surprised they [park supporters] hired a lobbyist. Money is no object for them,” said Robbins, a retired former president of Robbins Lumber Co. of Searsmont, which feeds its sawmill operations from woods near the proposed park location. Robbins is one of many logging landowners who have said that a park would damage his industry and the state’s land management system. Park proponents have maintained that a park would draw vast numbers to the Katahdin region and co-exist well with other industries. They have used photographs of logging operations adjacent to park boundaries in other states to make this point. Farmer said St. Clair respects the local votes, but the proposal is a Maine issue that has drawn significant support in statewide and regional polls. St. Clair also said they believe a petition released Tuesday with 13,580 signatures, including 2,750 Mainers in 371 towns, shows robust and growing support for the park. Today, Quimby is serving a six-year term as a member of the board of directors of the National Park Foundation. With its board chaired by Secretary of the Interior Sally Jewell, the nonprofit organization Congress formed in 1967 encourages “private gifts of real and personal property or any income” to the park service. Quimby’s term expires next year. St. Clair said he has met Jewell socially but they have not discussed his proposal. Maine’s congressional delegates have said they have no immediate plans to propose park legislation. Collins, King and Poliquin released statements last week reiterating that popular support from the Katahdin region, the region’s “economic well-being” and continued access to lands in the area are important to securing their support for a bill. National monument designations don’t follow any particular timeline or come with mandatory review periods, Brengel said.